The crotal bell is one kind of sheep bell. Bells were worn by some sheep in a flock, particularly (in the parish of Market Lavington) if the flock roamed on Salisbury Plain. The reason for sheep bells is disputed. Some say it was to help a shepherd find his flock if he couldn’t see them, but others say a good shepherd would not have let the sheep out of his sight. Another idea is that a working shepherd, who could see his sheep, got a warning of the sheep getting disturbed if he heard more bell ringing. Yet another theory says that shepherding was a lonely life and the shepherd just found that the sound of the bells offered some company. 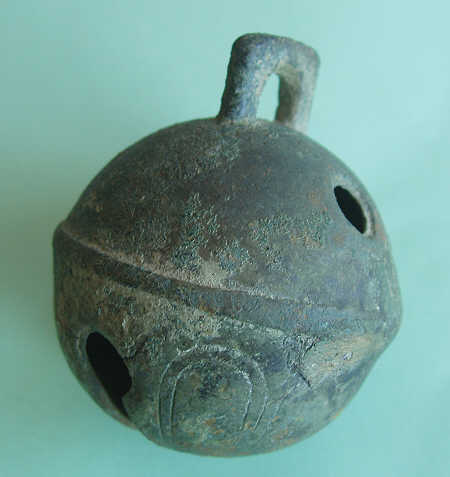 This bell was found by a local metal detectorist. Market Lavington Museum know where it was found. People who use metal detectors can meet with disapproval but we work with a local enthusiast. The arrangement works well for all concerned. The bell was given to the museum just a couple of days ago. The bell was almost certainly made in Aldbourne in northeast Wiltshire at the foundry of Robert Wells. If so it dates from about 1780. However, the Whitechapel foundry bought the Robert Wells moulds. This means it is possible that the bell was made in East London in the nineteenth century. This entry was posted on March 10, 2010 at 9:35 am and is filed under Museum. You can follow any responses to this entry through the RSS 2.0 feed. You can leave a response, or trackback from your own site. I’m researching a similar bell owned by my (farming) family for over 50 years. Although a ‘find’ it is in excellent condition, perhaps because it was found before the use of chemical fertilisers became widespread. – if there is a number cast into the top half of the bell. The Wells foundry made these bells in a range of sizes – I’m trying to find out if the cast-in numbers visible on many of these bells correlate to the size (for approx 5cm, I would expect it to be 4 or 5). I too am a detectorist. I was hunting in the Annapolis Valley in Nova Scotia Canada and found a crotal bell the same as the one pictured above with the horse shoe motif. The only printing on it is No 1. I found the same Crotal Bell in a large wooded section in New Jersey, U.S.A. I was metal detecting with a few friends at a site of a large British Encampment used during the American Revolution. The bell cleaned up nicely and has a number 3 on the bottom with Sunburst symbols on the bottom half. I can’t see any initials on it anywhere. I found a bell yesterday which appears to be identical. It is 2 inches in dia. It is very heavy and has a nice patina. Found in NE Iowa. A lovely find for you. I don’t know if Robert Wells, who made our bell exported, Now there’s something to find out.